Category: Necklaces. Tags: 35 inch necklace, Amethyst and Rose quartz, anniversary gift, artisan jewelry, artisan necklace, Birthday gift, Birthstone gift, cluster gemstone necklace, dangle gemstone cluster, designers jewelry, energy stones, gold and silver necklace, graduation gift, graduation gifts, handcrafted in Toronto, handmade necklace, healing stones, holiday gift guide, holiday gift idea, huge pink chalcedony, jewelry online, long layering necklace, made in canada, magenta pearls, mixed metal necklace, mothers day gift, one of a kind, pink chalcedony and gemstones, Pink Chalcedony necklace, Pink Chalcedony pendant, pink pendant, prom necklace, Rose Quartz, ruby gemstone, unique jewelry, valentines gift, wire wrapped pendant. 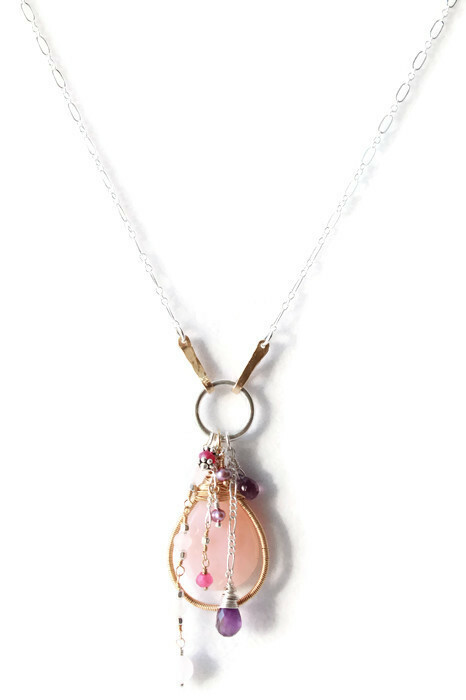 © Gemstone cluster necklace with huge Pink Chalcedony stone in mixed metals. 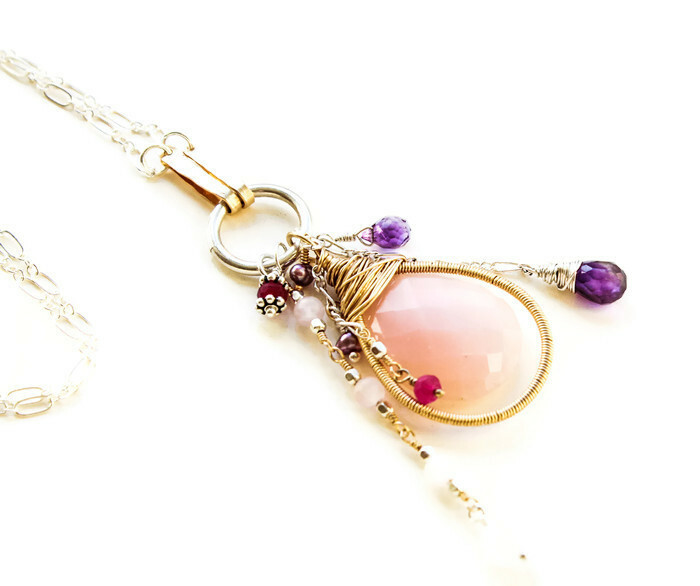 Pink Chalcedony AAA quality stone pendant and Amethyst, Roze Quartz, Ruby gemstone and pearls in 14k gold filled and sterling silver metals. Long layering necklace. Mother’s day gift. Graduation gift, prom jewelry. Anniversary gift for her.Unique, one of a king artisan necklace. Stunning, extremely beautiful Pink Chalcedony faceted pear cut briolette, extra large, 24 mm x 19 mm approximately. AA quality stone with beautiful milky pink color, nice faceting, pear shape. 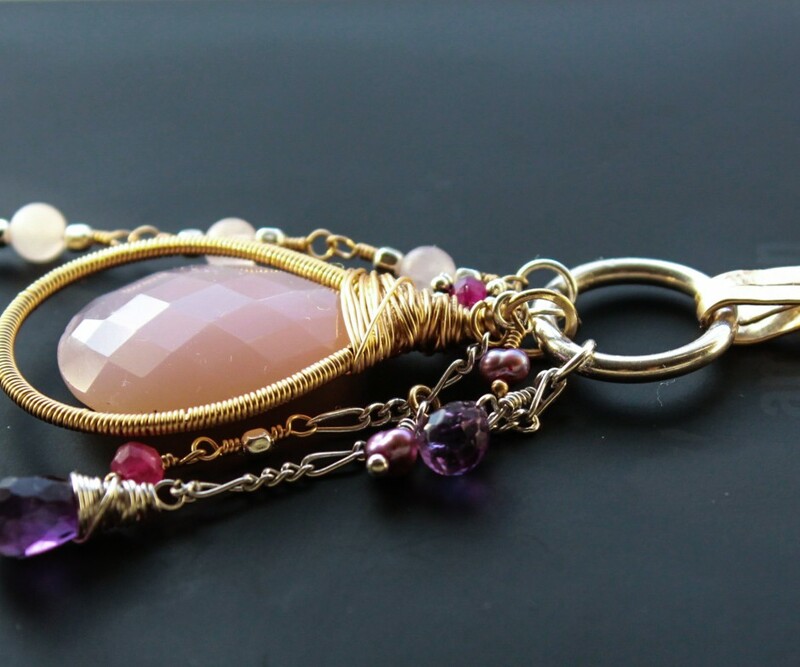 The stone is framed with wire wrapped gold filled wire and attached to sterling silver ring, together with the other gemstones and pearls. 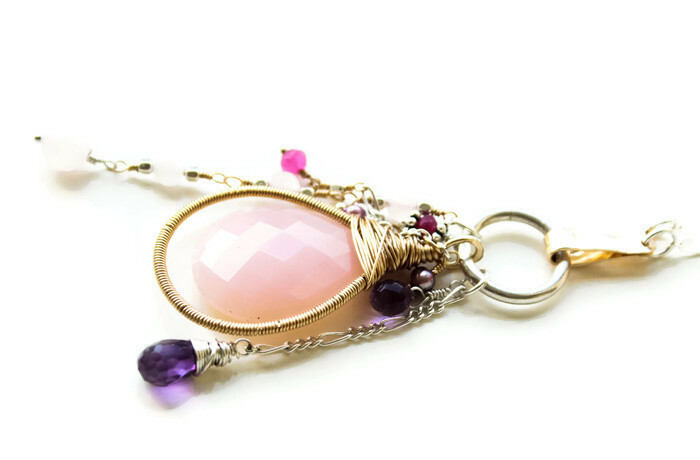 The cluster is made from Rose quartz round matte finish beads, wire wrapped in a rosary style in gold ans silver, Amethyst teardrop briolettes in sterling silver, Ruby gemstone, Magenta pearls, all in a beautiful mix of sterling silver and gold wire and chains. The pendant is attached to a sterling silver figaro chain with two gold filled, hammered, hand forged bails. 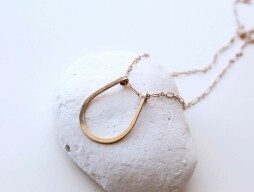 Total length of the necklace is 35″. Chalcedony brings the mind, body, emotions, and spirit into harmony. It absorbs and dissipates negative thoughts, emotions and bad dreams. 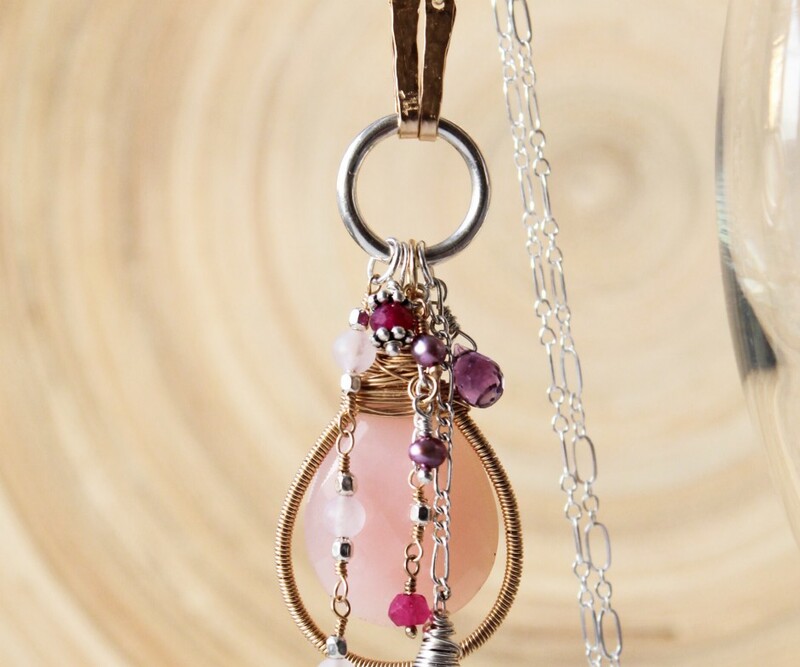 The Pink Chalcedony encourages kindness, creativity and all good qualities. 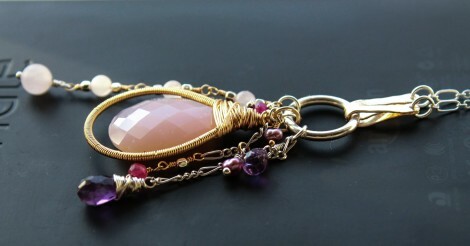 Amethyst guards against psychic attack and blocks negative environmental energies. This stone will help you to be more focused and productive, will improve your motivation, and will help you with decision making. 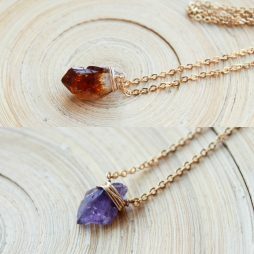 Emotionally, amethyst is said to bring emotional stability and inner strength. Rose Quartz will help you to know and accept your true self, it teaches self-love. It’s the stone of unconditional love and infinite peace. 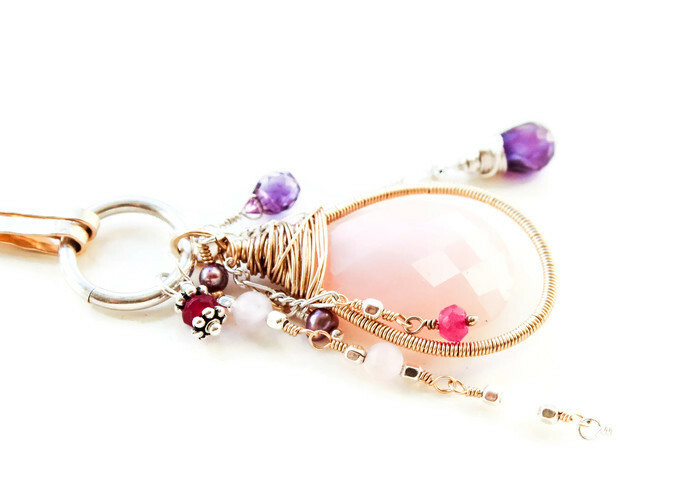 Rose quartz gently draws off negative energy and replaces it with loving vibes. 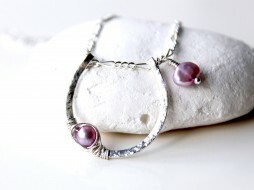 It’s working well when matched with amethyst.